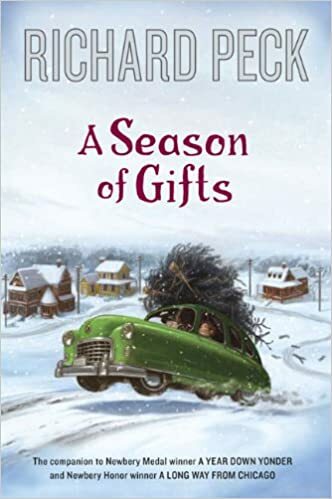 I read the book A Season of Gifts by Richard Peck a few days ago. It was a quick read. Published in 2009 by Penguin Young Readers Books, it was copyrighted in 2009 by Richard Peck. His books about Illinois with Mrs. Dowdel make me laugh. I like this one because the new family in town is a pastor and his wife with three delightful PK’s – better known as Preacher’s Kids. My kids were mostly grown up by the time my husband became a pastor. Our youngest was a senior in high school and unfortunately we changed churches half way through her senior year. That was hard on her. What a transition. Anyway, she kept her faith in Jesus through it all. Praise God! Act_3:16,(ESV) And his name—by faith in his name—has made this man strong whom you see and know, and the faith that is through Jesus has given the man this perfect health in the presence of you all. Soon after that the priests and the captain of the guard and the Sadducees encountered them and Peter found himself in trouble with them. I love reading the book of Acts and seeing the power of God displayed. 1Peter 4:7 The end of all things is at hand; therefore be self-controlled and sober-minded for the sake of your prayers. 1Pe 4:8 Above all, keep loving one another earnestly, since love covers a multitude of sins. 1Pe 4:11 whoever speaks, as one who speaks oracles of God; whoever serves, as one who serves by the strength that God supplies—in order that in everything God may be glorified through Jesus Christ. To him belong glory and dominion forever and ever. Amen. 1Pe 4:12 Beloved, do not be surprised at the fiery trial when it comes upon you to test you, as though something strange were happening to you. 1Pe 4:13 But rejoice insofar as you share Christ’s sufferings, that you may also rejoice and be glad when his glory is revealed. 1Pe 4:14 If you are insulted for the name of Christ, you are blessed, because the Spirit of glory and of God rests upon you. 1Pe 4:17 For it is time for judgment to begin at the household of God; and if it begins with us, what will be the outcome for those who do not obey the gospel of God? I got thinking about Richard Peck. He wrote respectfully of the family in A Season of Gifts, and he showed some persecution that PK’s in that day may have had to put up with. He adds some dark humor with it, but it got me thinking about Jesus telling people to turn the other cheek. I’ve always pondered that, to tell you the truth. I’m not exactly sure what that looks like. A lady from another church attends ours on Sunday night. When she was young, she got bullied in school and it got really rough. She’s about 50 now. Anyhow, I asked her if she ever told on the kids or got back at them. Nope. She put up with it, turning her other cheek. I don’t remember hearing that teaching as a kid. I remember my dad breaking up a fight in the neighborhood when two teenagers were beating up each other. Yet, I think we were taught that the only way to stop a bully was to fight back. Well, anyway, at the back of Richard Peck’s book they advertised a book he received awards for entitled, The River Between Us. So I imagine I’ll read that one next week. I’ve read a lot of fiction about the Civil War because I’m a Gilbert Morris fan. This book about the Civil War is written for Young Adults, whereas most of Mr. Morris’s books that I read were written for adults.